Hi everyone. I stumbled across your site while looking for parts for my current project. And it looks like you are the guys that I need to be talking to. I am a member of BlackLight Company paintball team in Denver, CO. 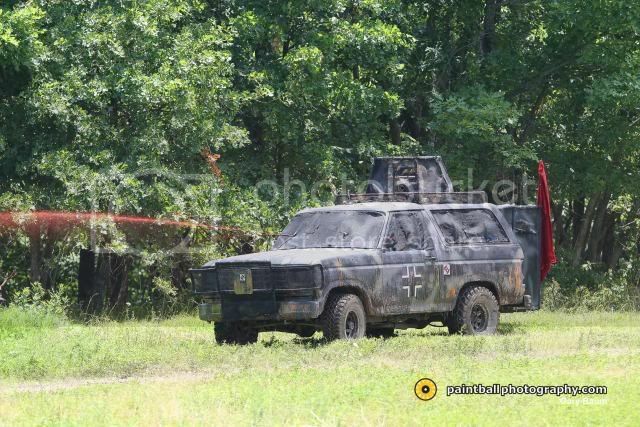 I am also the owner of QuickStrike PAV (paintball armored vehicle, think paintball tank). In some of our games we will simulate flame throwers with water guns loaded with diluted craft paint. I am looking to add one of the flame throwers to our vehicle. Here is another tank using its flame thrower. Initially I was thinking pressure washer handle/grip and nozzle with a 5 gallon cistern, pressured to whatever gave me the best range and streamlined flow. Do you guys have any thoughts on this? I am sure the nozzle makes the difference. Typically you don't need to do much more than about 100psi. Since you have a pressure source, connect it to a regulator and into the top of the cistern. Take a pipe out the bottom, to the firing valve and onto the nozzle. The cistern needs to be capable of withstanding the pressure in this case. You'll also want a fill valve, and a pressure release valve (in case the regulator goes wrong), both at the top. An alternative would be to use the 12V DC to power a motor connected to a pump. That would probably be bulkier and more expensive for the same performance, but has the advantages of being independent of the CO2 supply (that I presume fires the paintballs) and not placing the cistern under pressure, meaning it can be lighter duty and refilled while firing. The best valves are large ball valves. However they need a torque arm to be easily turned, you may not have space in the vehicle, in which case consider alternatives, or electrical actuation from a 12V DC motor. The pipe from the cistern to the nozzle should be as wide and straight as practical - it'll likely be the same diameter as the ball valve. For a nozzle, try the laminator. It's described in this forum. For fixed other components, there will be a particular nozzle diameter that gives maximum range. Since you're adding paint, you could add glycerin as well. It's safe, cheap, and will give a range boost. I'm not sure how flamethrowers are actually set up (i.e. how to refill and re-pressurize them), but you should easily be able to get at least 50-60 feet of range with what we use here, up to the 70's if you go for high pressures and large (1/2") nozzles. However, most flamethrowers probably don't use quite near that much output. Also, simulated flamethrowers will obviously lack the ability to spread out and burn down structures; I'm not sure how your team is going to implement rules on that. Perhaps sheer volume could compensate for it. We usually don't use them on structures. It is mostly a tool for cleaning out trenches. We are limited to 5 gallons per game (day), so the larger flows/nozzles will use up the tank pretty quickly. We don't have to soak a player to get them out, just gets some spray on them. We can depressurize the tank to fill it. Also, I have used windshield washer pumps, in the past, to make water guns. cantab and CA_99 make some good points. Post a bit more about the energy systems you have available. How much CO2 (mass) do you have on board? And how many amp hours is your battery rated for? This'll give us a much better idea of the potential capabilities of the system. Any budget information would be extremely helpful. Also, how much paint flow is desired? Pressures beyond about 60 psi are essentially pointless. In my experience the increase in range is neglegible beyond that point for efficient water guns. Water (err... paint) flow continues to increase with pressure, however, and as you'd want to conserve ammo you're interested in not using too high pressure. Good electric pumps are expensive. I did the quick math (pump power = flow * pressure at ~80% efficiency combined power = I * V) and you'll need about 2.2 amps to shoot at about 50 psi and 20X (water gun lingo for ounces per second). So it is possible to get at high level of performance without too much current, but the pumps are pretty damned expensive from what I've seen. And I have no idea what the capacity of your battery is so something as described might not be feasible for an entire game. CO2 limits your materials to metal because of the temperature. You could probably do something similar in design but not look to an old gun of mine I called SuperCAP. Realize that gun was an exercise in insanity before looking at the photos. CO2, as it is stored solid, uses much less space than air. This is one reason I'm betting your CO2 is much more viable. One crazy idea: use high viscosity paint. Increasing the viscosity of water is something that can be done to increase range. I've done it with glycerin, which is expensive. I've been told pool chemicals can do the same, but I've never investigated it. I do know paints with different viscosities are made so this is worth investigating. Also, if you want a lot of paint cheap, go to places like Wal*Mart and get the paint leftover from customers who didn't like the color. 5 gallons is quite a lot - 640 or 800 fluid oz (depending on whether you're using US or Imperial units). Even at quite high outputs that'll last a bit. To get 50 ft range will probably require around 20x (20 oz/s) output, and that'd last around 32 seconds - which doesn't sound like much but when one hit kills that's a lot, though if your aim is to saturate an area it's not. I'd suggest making it possible to pull the barrel within the vehicle to change nozzles. The main purpose of high output is for range, not necessarily just for soaking. As Ben suggested, viscous paint won't require as much output for certain range. Ben makes an important point about using metal. Anything cold and pressurized doesn't work with plastics. Wow, thanks for all the ideas. Keep them coming. Ben wrote: Welcome to SSC. We carry 20# of CO2. It is more than enough to last all day. I have never run out. At our biggest game last year, we shot 7 cases of paint (14,000 rounds) and still had nearly 5# remaining. In some games we also run a nerf launcher off the CO2 system. The battery is a car battery, and it is charged when the engine is running. If need be the battery can be upgraded. Ben wrote: Any budget information would be extremely helpful. We want quality and dependability, but it is always nice to be cost effective. I think we want to minimize flow, while maximizing range. I guess I'll have to find that sweet spot. At normal temperatures, and around 800 psi, it is actually stored in a dual phase liquid/gas. A portion of it is in the liquid phase and the rest is in the gas phase. As you remove gas from the container, the pressure drops and some of the liquid boils off as gas. If a CO2 container is vented rapidly, it can collect ice on the outside surface of the container. This is due to the energy transfer required to boil the liquid. Ben wrote: Also, if you want a lot of paint cheap, go to places like Wal*Mart and get the paint leftover from customers who didn't like the color. We actually use the washable tempera paint that kids use in art class. It is watered down, and is a bit thicker than water. Most players probably wouldn't like a latex shower.